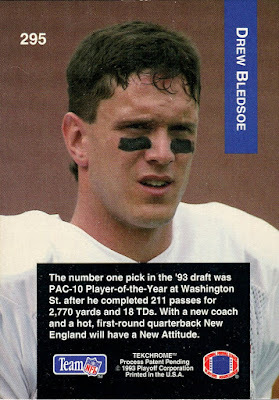 I wanted to give a quick shout out to Colby at Cardboard Collections for the free Drew Bledsoe card. He has was giving away a few lots of cards and when I saw this Bledsoe, I knew it would make a great addition to my WSU Cougar binder. Although the "Washington State" name was removed from the front of his jersey, you can still see the Cougar logo on his arm and "Cougars" written on the helmet. The front has Tekchrome technology, which is essentially today's chrome look. In person, Bledsoe's body pops off nicely from the background. Bledsoe famously lost his starting job to second-year player Tom Brady after Bledsoe went down with an injury. Brady would go on to lead the Patriots to their first Super Bowl win. Bledsoe moved on to the Buffalo Bills the following year. 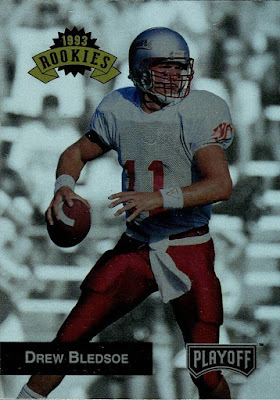 Bledsoe was a Cougar great and it's nice to finally have a rookie related card. Thank you Colby! I recently brought home the last of my old boxes from my dad's house. One of the boxes contained my 6th grade yearbook. Looking at my likes and dislikes section next to my name you could tell I was a basketball fan. My likes included "Rodman, Bulls" whereas my dislikes were "LA Lakers, doing homework." Nowadays, my interest in basketball (at least at the professional level) is all but gone. Other than checking in on some players from my alma maters and seeing if the OKC Thunder are still title-less, I don't follow the sport. That doesn't stop me from opening card packs, however. My grocery store happened to have two untouched boxes of 2016-17 Panini Prizm. The boxes said they contained 1 autograph or memorabilia card on average so feeling the itch for some new wax, I grabbed three packs from the top box. 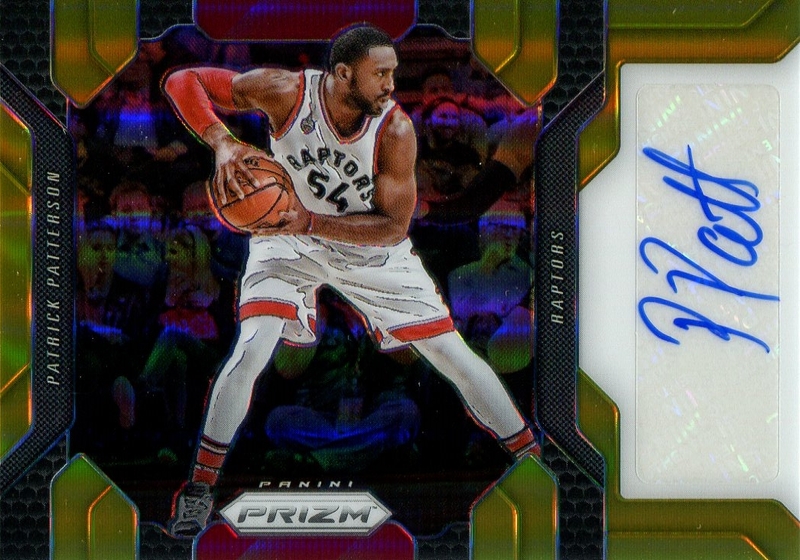 Amidst some base and prizm parallel cards was a gold parallel autograph of Patrick Patterson numbered out of 10! This was without a doubt my best retail pull ever. Patterson was the 14th overall pick in the 2010 NBA Draft. 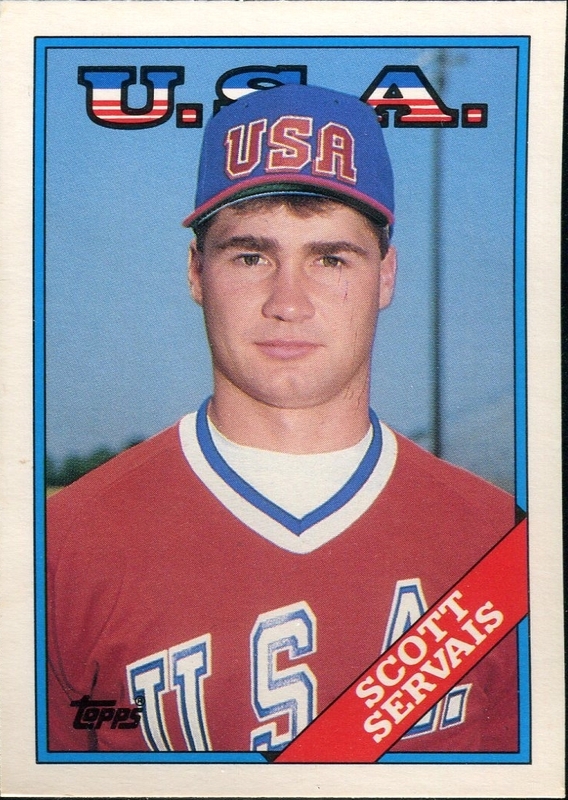 He's not an all-star but he appears to be a decent player. The next night I was at the store again. The two Prizm boxes remained virtually untouched. Since I pulled what was likely the only auto out of the first box, I went for the second box hoping for some more luck. This time I only grabbed two packs. One of the packs contained a teal wave parallel of Ben Simmons, numbered out of 25! 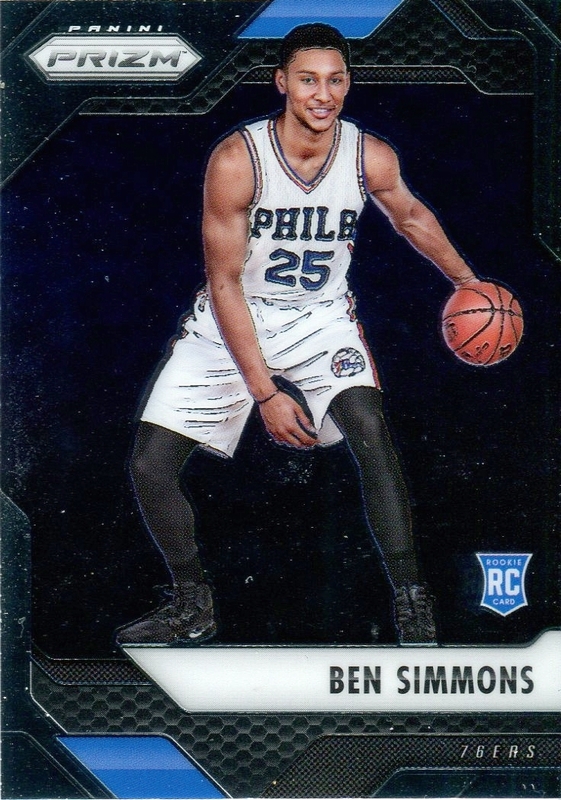 I knew that Ben Simmons was a big deal, being the #1 pick in the overall draft and signing an exclusive autograph deal with Upper Deck. 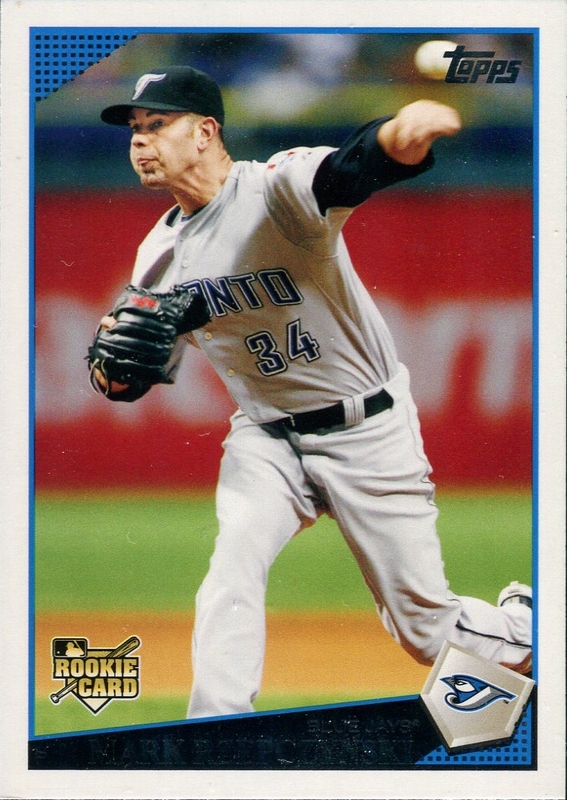 I didn't realize that his cards were so highly sought after. 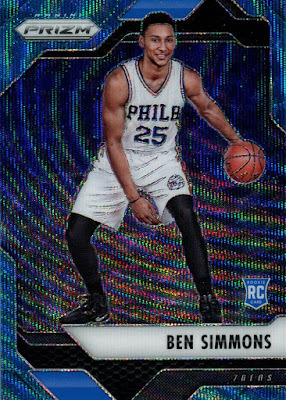 On top of the parallel, I pulled his base rookie in the next pack. Word came down Friday that Simmons is officially out for the rest of the season due to his foot injury. 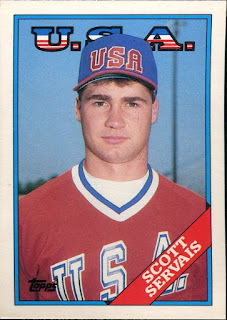 He never played a regular season game this year. With all the hype it will be interesting to see how well Simmons plays next year. A few days go by and I'm at the store again. I had to check my boxes of Prizm and they were still rather full. It's not too surprising as the Seattle area is mainly a football town with a lesser interest in the Mariners. I grabbed four more packs, two from each box. This time I pulled another teal wave parallel! Another SN25 parallel! 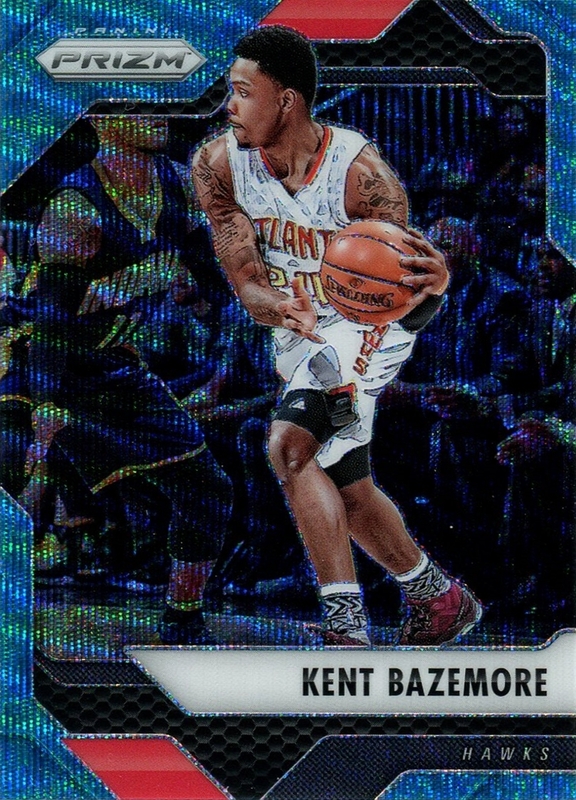 Kent Bazemore is not a big name but still a big pull! I never thought I would have gotten so excited about basketball cards. I couldn't believe my luck with all the great cards. For now, these are my best retail pulls and will be hard to beat! This is the tale about four common cards that took a fun, little trip around the state in 30 days. Last month I made a small 4-card order on COMC. 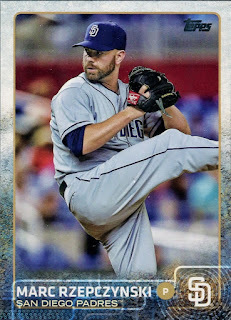 I purchased a few cards in preparation for Mariners Fanfest, hoping that I could get them signed. In order to ensure their arrival before the event, I upgraded the shipping so that they would arrive in a few days. On January 17, I requested shipment of the cards and the next day they were shipped. Fortunately, or so I thought, COMC is located in my neck of the woods (Seattle area). This means orders typically arrive quickly after they are shipped. I checked the tracking number the day after the order was shipped, January 19, and I saw that the package was labeled as out for delivery. Wonderful, everything was working out. At the end of the day, I check my mailbox but did not see the package package. The tracking number was not updated either. I waited until the next day thinking it would be delivered then. Again, no package. This time the tracking number was "updated" to merely indicate that the tracking number was never updated after it was marked "out for delivery." That was no help. I waited a few days giving the post office the benefit of the doubt. After the weekend ended, I called my local post office for helping tracking down my package. I left my information with someone who said they would call me back at the end of the day. I never heard anything. Several days after submit my info through the website, I get a call my from my post office. The person I spoke to essentially said they cannot find the package and there is nothing I can do since the package was not insured. I was disappointed but not too upset since all the cards I purchased were cheap commons. I think shipping cost more than the cards. The other day I was getting ready to e-mail COMC saying my package was lost. I hoped that at the least I could get a refund on shipping. I click on the tracking number and to my surprise it had updated! On February 8, the package had somehow made its way to Spokane, which is 4 1/2 hours away on the other side of the state. This was the first tracking update of any kind since January 19. The package then made its way *back* to Seattle. It was finally delivered on Feb 12. To illustrate the absurdness of the delivery route, I have annotated a map of Washington below. My package was shipped from and to the Seattle area, which is by the black arrow on the left. 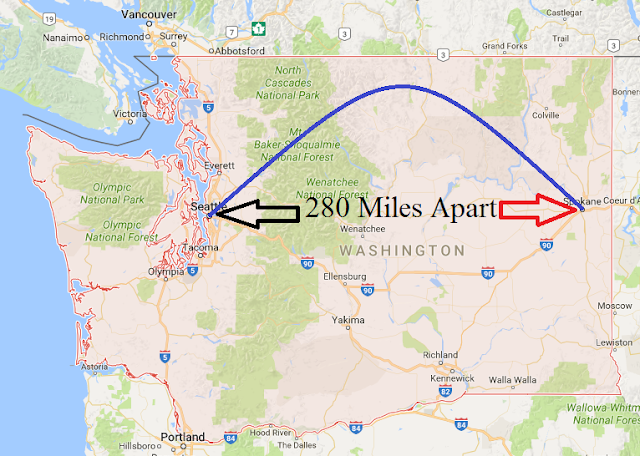 My package, at some point, traveled to Spokane, which is at the red arrow on the right. How a package goes from literally being out for delivery to traveling to Spokane, I will never understand. I never worried about their location as the cards never would have been missed. That said, I'm happy they made their to their rightful destination. Today I received my first through the mail autograph from an unexpected signer. 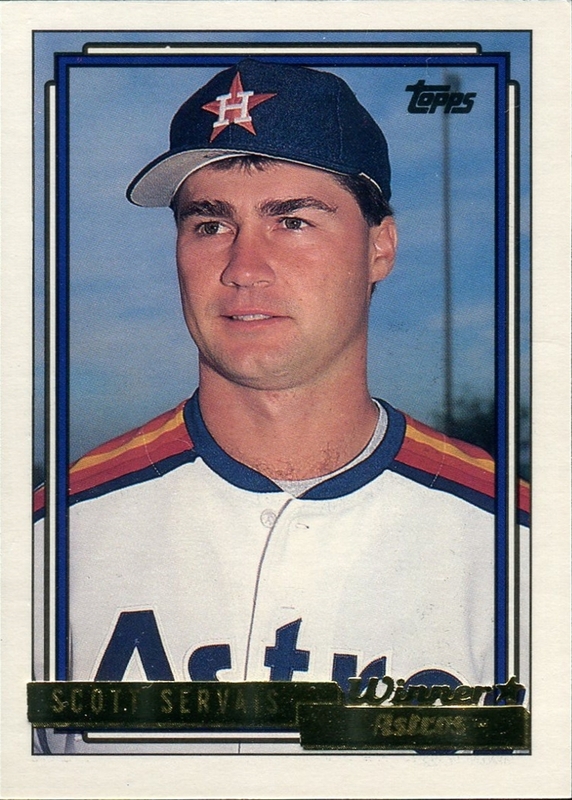 I saw a post a few weeks ago that Burke Waldron signed quickly for autograph requests. 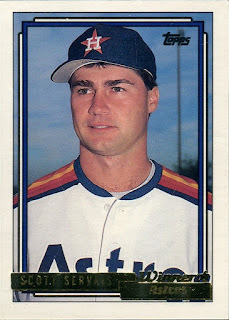 However, Mr. Waldron is not an athlete. 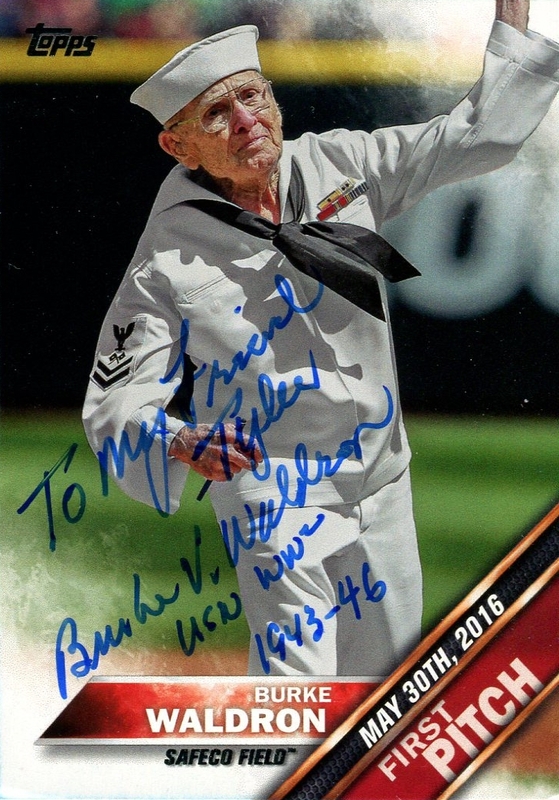 No, he is 92-year-old World War II veteran who threw out a first pitch at a Seattle Mariners game last year. He was lucky enough to be featured on a First Pitch insert for the 2016 Topps Update series. 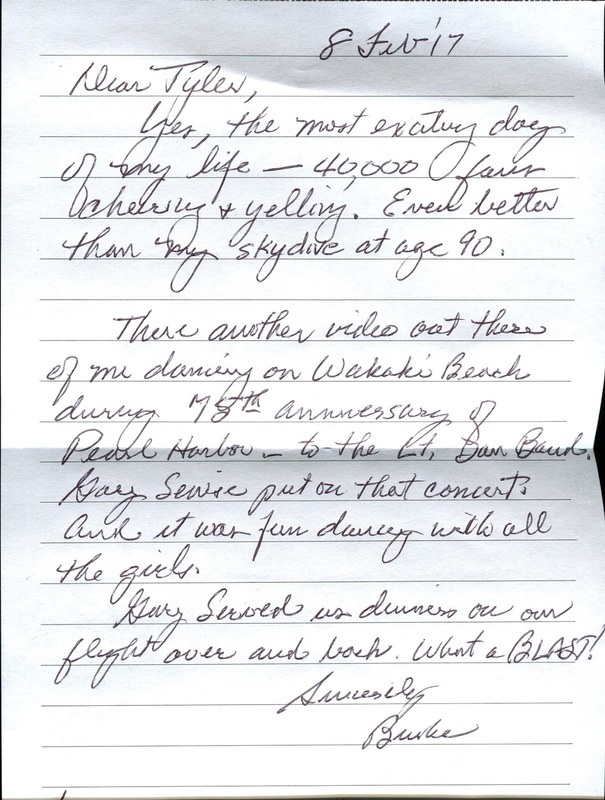 I sent Mr. Waldron a copy of his card, along with a small note saying he looked like he had a lot of fun. He went above and beyond signing the card with an nice inscription. His first pitch is truely worth watching. Despite being 92, he had the hustle and zing of someone half his age. Yes, the most exciting day of my life--40,000 fans cheering & yelling. Even better than my skydive at age 90. 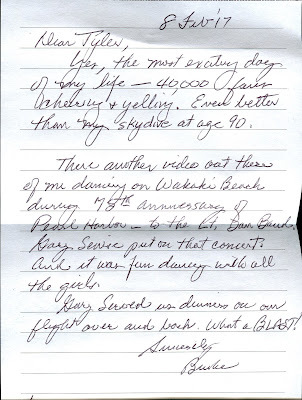 There [is] another video out there of my dancing on Waikiki Beaching during 78th anniversary of Pearl Harbor--to the Lt. Dan Band. Gary Sinise put on that concert, and it was fun dancing with all the girls. Gary served us dinner on our flight over and back. What a BLAST! That does sound like a blast! I would love to find that video he mentions. And let it be said that for his age, his penmanship is excellent. Far better than mine currently! This was a very fun TTM request that will be hard to top.